As with all CRG mirrors, CRG uses custom convex glass formed to our own specification to give you the perfect balance between field of vision and image magnification. To reduce glare, the glass has an automotive quality mirror tinting. Rubber mounting helps the glass resist vibration. 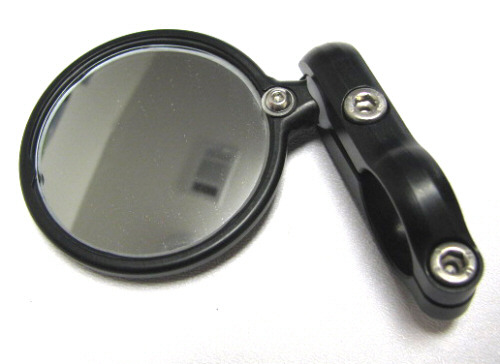 The lightweight but sturdy construction allows the Blindsight Mirror to be positioned for optimal viewing without concern of movement during high speed runs or excursions over rough roads. • Extension elbow is reversible to allow for either left / right side use. RhinoMoto Two Piece Bar End Weights with CRG barend mirror recesses, Round Bar End Cap, Black Sold as a pair.